It’s a great idea to check for the need of same day Garage Door Repair Eastvale CA by checking the doors balance. You can do this easily by opening the garage door partially and then stopping it’s progress. If the garage door slides significantly when stopped or continues lifting in spite of you trying to stop it there’s likely an issues with the motor operating system. If, instead, the garage door slams shut, slants at the stopping point, or slowly and roughly rises, there’s likely an issue with your garage door’s balance. The value of our service is economical as well as undeniable. Getting your Garage Door Repair Eastvale CA will add value to your home, improve the home’s energy efficiency, and give your home great curb appeal. We will use our expertise to help you pick out the right garage doors for your home or business, and bring your garage doors from just being functional to being fashionable. Glass garage doors that are frosted give the front of your home a secure and beautiful look. When the frosted glass is lit from the inside, it will glow inside and illuminate the exterior of the home. The glow from frosted glass on a garage door will give the home an air of sophistication and add beauty to the exterior of the home. Did we mention that Chapman Garage Door does Free Estimates for Garage Door Repair in Eastvale? Whether it’s mandatory, or your business is taking extra safety precautions, we will travel to your site to deliver garage tune-ups and inspections. You are our family, so we want to make sure things are running safely and efficiently. Did you know that repairing a broken garage door substantially increases the value of your home? That’s right. When you sell your house, your buyers first impression depends on the curb appeal. Home buyers see many houses and they are usually picky when it comes to such big investments. We all want a house better than the neighbors’. We all want a home that will be admired by our friends and family. Many homes have garage doors. Often, garage doors are the largest moving part in any home. When they malfunction, it can be a big hassle for homeowners. Fortunately, homeowners in the Eastvale CA area can turn to a reputable service company, Chapman Garage Door, for quick turnaround repair services. 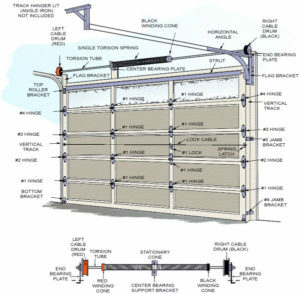 To maintain your garage door’s beauty and functionality general servicing should be performed at least once every year. For specific garage door issues, however, Garage Door Repair Eastvale CA from trained, licensed, and experienced contractors must be performed as soon as possible to return your home’s garage door to a state of full usability. Your home’s garage door is not only a crucial entryway to your home, its typically the largest mechanized part of the entire household. This makes it necessary to have experienced professional Garage Door Repair Eastvale CA contractors involved in the repair process to ensure quality results that last. We have more than 2 decades of experience with garage door service and repairs. You can depend on us for a prompt response and quality repair backed up by our exclusive workmanship guarantee. Let us be your go-to resource for Garage Door Repair Eastvale CA. If you are a homeowner in Eastvale CA, you should rely on Chapman Garage Door for all your garage door repair needs. We have earned a strong reputation throughout our local area as the #1 garage door company. Many homeowners turn to Chapman Garage Door for Garage Door Repair Eastvale CA and other nearby locations. We hold a license issued by the state of California. These endorsements prove our commitment to quality and service. In addition, we provide a workmanship guarantee on every repair we complete. That means, when you call Chapman Garage Door, you can trust that your money is well spent and that your door will operate properly after our visit. As an added benefit, we also offer competitive pricing on garage door repair to all our local customers. At Chapman Garage Door, we have over 20 years of experience in garage door repairs. We can replace parts, fix garage door openers, or provide complete garage door replacements to suit your needs. If you do need a new garage door, or just desire an upgrade, Chapman Garage Door Repair Eastvale CA has a complete selection of attractive options. We can visit your home and give you expert advice on what types of door works best for your home. You can be enjoying a new garage door and new look for your home exterior in no time when you contact us. In addition, we offer garage door openers and can install them in your home very promptly. You can be enjoying a new garage door and convenient automatic opener in a very short time frame. We can also provide complete garage door replacement. If your door becomes damaged, it may be more efficient to replace it instead of repairing it. We also consult to homeowners in the Eastvale CA area who desire a new garage door to provide a new look for their home exterior. We can also advise you on garage door openers that will work with your new door. You can enjoy a brand new auto-opening garage door in a very short time frame. Chapman Garage Door takes pride in offering exceptional customer service to homeowners in the Eastvale CA area. Give us a call today to discuss your garage door repair needs. If you live in Eastvale CA and need garage door repairs, Corona or other local areas, you can turn to the experts at Chapman Garage Door. We take pride in being a trusted provider of garage door repairs and service to our community. When you contact us, you are following in the footsteps of many homeowners throughout Riverside County who made the best possible choice for Garage Door Repair Eastvale CA. We look forward to hearing from you and servicing all your garage door opener repair needs. Give us a call today. We have a great selection, extremely competitive pricing and a sales and service department second to none. Whether you are a builder, Architect or a homeowner we can help you make the right decision on your garage door selection and make the process of choosing a new or replacement garage door smooth and trouble free. I replace torsion springs the same day you call. Don’t spend more money on those big companies. Call Chapman Garage Door for all your garage door repair needs. Garage Door Repair Eastvale CA is important in the appearance of your home. we are capable of handling repairs on carriage house, sectional and contemporary garage doors. Since we consult with you at your home, you can most easily select which is right for you. You will want to choose the Garage Door Repair Eastvale CA that best fits your home, and will find the right one from among our many options. The great news is, you can. Not with just any company either. A well established, rock solid, family-owned business started in 2004 with over 17 years experience. No matter how you slice it, that’s a lot of knowledge. We are acquainted with every aspect of Garage Door Repair Eastvale CA so you don’t have to be. We can take you from the glimmer of an idea to a completed project you can be proud of. With over 17 years of experience, we are your choice for Garage Door Repair Eastvale CA. We are family owned and began in 2004. We come to your house and show you a huge selection of garage door repair options. There is no charge for this personalized service, and you’ll benefit from our experience in making your house a home of distinction. We serve the Eastvale area, delivering quality service, value and selection. Whether you need sales or service, we stand out with our excellent reputation. Another important aspect of Garage Door Repair Eastvale CA is the Door Opener Installation. To ensure that you find the perfect opener for your own home, you can speak to our staff in Eastvale CA at a time convenient to you. Rest assured that these openers can weather almost any condition; they are a highly reliable product designed for long-lasting functional operation. There are models of the door opener for all types of customers, whether you want to cut down on noise or want to save space in your garage. Chapman Garage Door Repair Eastvale CA is a family owned garage door company that has been in business since 2004. The owner has 17 years of experience in this type of business. The company has an exceptional reputation for high quality, value, and selection. We serve the Eastvale area with a focus on the inland empire neighborhoods, so if you need an expert with garage doors in Garage Door Repair Eastvale CA, give us a call. You never know when you may have unexpected company for the holidays. Chapman Garage Door comes in a variety of colors. If you are shopping for a loved one, come in and see what we got. You’ll save a bundle of money and you’ll have fun, too. Your business can’t go wrong when choosing Garage Door Repair Eastvale CA. It is specifically engineered for extra durability to assure you of years of dependable operation. The garage will help enhance your business’ success in undeniable ways. It will allow you to work both quickly and efficiently in times of stress. The Garage Door Repair Eastvale CA will also support you in even the toughest industrial environments. We know that your garage is under a lot of ware and tare, so we use the best materials in the industry. We promise that your Garage Door Repair Eastvale CA will not be a let down, and that it will be safe and reliable for you to operate. At Chapman Garage Door, we know a broken garage door can be a major inconvenience for our customers. We also know that malfunctioning garage doors can present a serious safety hazard or damage risk to your home. For that reason, we focus on fast repairs—and can often service your garage door within one day. When you call us, we dispatch one of our expert repair technicians to your home with a fully stocked truck. That allows us to have all the parts and tools we need available to complete your repair efficiently. Whether your repair is small or large, we can restore garage doors in Eastvale to perfect working order in no time. When you contact Chapman Garage Door for service, we dispatch one of our professional technicians to your home as soon as we can. Our repair experts arrive at your home with a fully stocked truck. You can rest assured that we will have all the parts and tools needed to complete your repair readily available. Whether you need a minor repair, such as a hardware replacement, or something more complex, give us a call. You will soon see why many homeowners trust us for all their garage door repairs in Eastvale CA. When you call us for garage door repair, we dispatch one of our skilled technicians to your home as soon as possible. Every Chapman Garage Door technician arrives on site with a fully stocked truck, which contains all the parts and tools we need to fix your garage door. Our technical experts can provide a thorough assessment of your repair needs and complete repairs efficiently. No job is too large or too small. Whether you need hardware replacement, opener repair, or a complete new garage door installation, we can provide the service you need in your Eastvale CA home. When you need Garage Door Repair Eastvale CA, you want to work with the best company and the area. That company is Chapman Garage Door. At Garage Door Repair Eastvale CA, we have over 20 years of garage door expertise, the best parts, and a highly-skilled team. We also offer friendly and professional service to all our local customers. In addition, we hold a license from the state of California. No other local company can match our commitment to excellence and depth of professional expertise. Your garage door opener is the largest moving part in your home. When it malfunctions, it can be a very stressful issue for many homeowners. It may seem tempting to put off a repair, but that is never the best option. Whenever you need Garage Door Repair Eastvale CA, you can rely on Chapman Garage Door. We pledge to provide you with friendly service, expert advice, and quality repairs. Our devotion to providing the best garage door parts, service, and repairs in Eastvale CA is unsurpassed. We look forward to serving all your garage door needs. Chapman Garage Door has earned a reputation as a quality provider of Garage Door Repair Eastvale CA. We have over 20 years of focused experience in the garage door industry. If you need prompt, professional Garage Door Repair Eastvale CA, you can count on us. At Chapman Garage Door, we take pride in offering quality workmanship and fast service. We know malfunctioning garage doors can pose an inconvenience and hazard. That’s why we provide prompt repairs, usually the same day you call, to the Eastvale CA community. Our service territory spans Eastvale CA and the surrounding area. We are the top resource for Garage Door Repair Eastvale CA, and many other communities. We are licensed by the state of California, so you can rest assured that you are hiring a reputable service provider when you contact us. Our decades of exclusive focus in garage doors means that Eastvale CA homeowners can rely on us for the top quality repairs in our area. As experts with over four decades of experience, we know all about garage doors. We keep a supply of replacement parts in stock so that we can complete Garage Door Repair Eastvale CA very efficiently. In addition, we can repair and install garage door openers. If your garage door opener is malfunctioning, you need professional repair services. Call Chapman Garage Door if you want to have your repairs completed quickly by a true repair expert. Garage Door Repair Eastvale CA here make it easy for you to make a choice for your new or replacement garage door. New garage doors can enhance the appeal and value of your home and provide you with increased comfort, convenience, safety and security. Call now for professional assistance in making a choice on your garage door.